It's zucchini season! 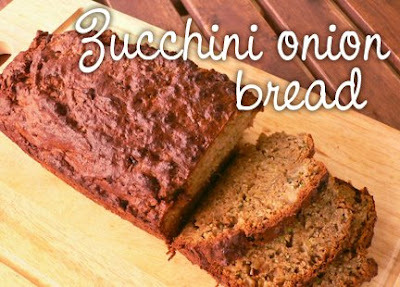 My mother-in-law gave me a bag of 6 giant organic zucchinis from her garden and so I gathered some recipes -- here's one that's moist and savoury! Delicious fresh out of the oven, and great toasted the next days. Preheat oven to 350F. Oil a loaf pan and lightly dust with flour. Saute the onion in a bit of olive oil or ghee until golden and soft, adding a pinch of salt and pepper. Let cool. In a large bowl, sift together all the dry ingredients: flour, baking soda, baking powder, and salt. Then stir in the parmesan or feta, dry herbs and spices, and fresh herbs. In another bowl, grate the zucchini. Squeeze out excess liquid with your hands, drain, then stir in the cooled sauteed onion, eggs, olive oil, and honey. Fold the wet ingredients into the dry. Depending on the amount of juice from the zucchini and onion, you may need to add some liquid (ie. soymilk or rice milk) to the batter if it is too thick to combine. The consistency should be like muffin batter. Leave out cheese or substitute with a soy cheese product or 1/3 cup nutritional yeast flakes for that cheezy flavour; replace honey with maple syrup or brown rice syrup; replace eggs with 3/4 cup water mixed with 3 rounded tablespoons of ground flax seed (well mixed and left to sit for 10 minutes to thicken). Inspired by Vanessa's recipe at What Geeks Eat. Ayurvedically, it's best not to cook honey as its only nutritional value is when eaten raw and unpasteurized; substitute with maple syrup or molasses. Hard cheeses are also not recommended; substitute with paneer or soft cheese. I've had zucchini on the brain a lot recently. So thank you for another great recipe! I will have to make it. I posted another version of a gluten-free zucchini but bread on my site Rice of Life a couple of days ago. We would like to feature your onion bread on our blog and possibly our digital-recipe reader, too.